Yesterday actors, producers and directors including Koo Tin Lok, Sean Lau Ching Wan, Carina Lau Ka Ling, Sandra Ng Kwan Yu, Jessica Hester Hsuan (Suen Huen), Raymond Lam Fung, Sonija Kwok Sin Nei, Joyce Tung Lai Ming, Annie Liu (Lau Sum Yau), Gordon Lam Ka Tung, Philip Keung Ho Man, Louis Cheung Kai Chung, Fiona Sit Hoi Kei, Andy Tien (On Chi Kit) and Dada Chan Jing attended the press conference. 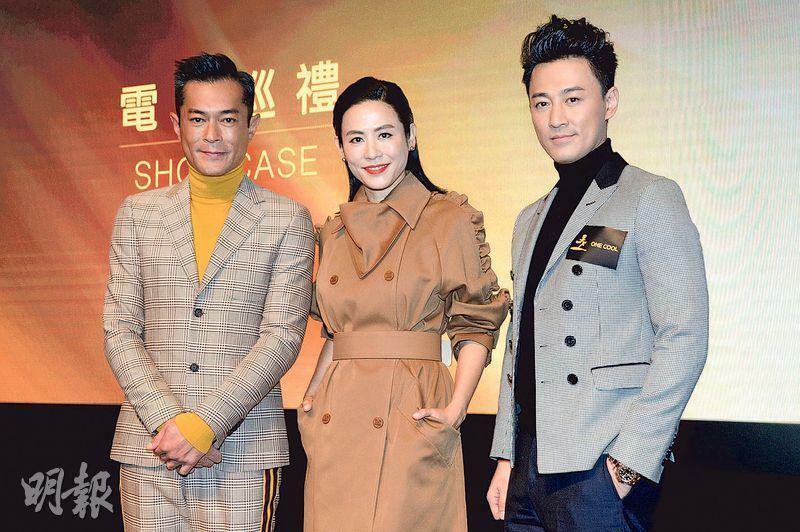 At the event Goo Jai and BACK TO THE PAST actors Suen Huen, Lam Fung, Michelle Saram (Suet Yi), Kwok Sin Nei and Tung Lai Ming shared their experience. Goo Jai said, "At first I didn't think about the original team. Since the series was made in 2000, many wanted us back together for the movie. In the end I still feel I have to use the original team." Suen Huen pointed out that when she found about the movie she was already happy for several years. "Finally the day I have been waiting for is here. Many people are more excited than me, so there is no room for error." Kwok Sin Nei said, "STEP INTO THE PAST was a very important to me because it was my first work. Thank you very much to Boss Koo for me being able to make the film version." Suet Yi pointed out that she has not seen this group of friends in many years. This was a rare chance and they would be able to catch up. Tung Lai Ming said, "Because Boss Koo told me about all the fighting, he scared me. I hope we would pay more for doubles." Lam Fung said that he heard Goo Jai talk about this script a long time ago, but each time he saw him Goo Jai would say that the script had changes. Later Goo Jai with Lau Ching Wan and Lau Ka Ling introduced the 540 million science fiction epic WARRIORS OF FUTURE (MING YUT JIN GEI). In the film Earth was no longer inhabitable due to pollution. The film needed even more long for special effects. Goo Jai said that the first time I was at the set he was in awe and excited, because it had actual sets for some bases and collapsed buildings. Actually Hong Kong people could achieve a very large scale film. As for the investment amount this time, Goo Jai said, "It is also very shocking!" Ching Wan said that during the shoot he had to wear a 30 pound armor. Did he get hurt? He joked, "I didn't get hurt, you can see how real my face look, no CG, but I heard Goo Jai got hurt because he was the boss." Later Goo Jai, Suen Huen and Lam Fung talked about this year "One Cool" would make more movies than Media Asia and Emperor. Goo Jai said, "As long as the movie is good and sincere, film companies need to invest. I want to innovate more and have more domestic subjects. (Ching Wan joked that your wallet suffered heavy casualty?) No no no, nothing like that. Movies should be made. (How much did you invest on movies this year?) You have ask the film company." He also revealed that BACK TO THE PAST (CHUM CHUN GEI) will soon start production. The film will be a continuation of the television version. Has his role in another film STORM CLOUD (FUNG WON) been confirmed? Goo Jai said, "It will have some new character additions." Ka Ling and Ching Wan boht said that they have never worked on a science fiction film before, so they were excited and looked forward to it. 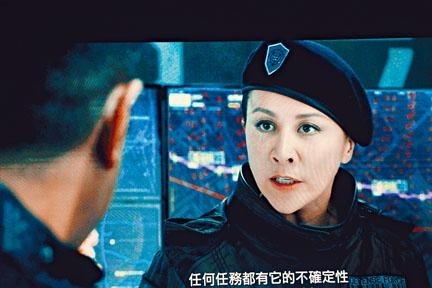 In the film Ka Ling played a military officer. She said that the toughest was remembering all the micro organism and military terms. The director had to explain them to her as they shot. Would they plan to help Goo Jai break out of Asia with this film? Ka Ling asked, "Isn't he already out of Asia? I thought he broke ou a long time ago." Ching Wan said that his first science fiction film felt very fresh. Ng Kwan Yu would produce and star in ON YOUR MOM, GET SET, GO! (MA MA DIK SUN KEI SIU JI), which was based on the Paralympics gold medal track athlete So Wah Wai's story. Would Kwan Yu play So Wah Wai's mother? She said, "I haven't played a mother role, not to mention So Wah Wai's mother. How could I have So Wah Wai, my daughter is only 12. It's very hard." She pointed out that So Wah Wai's mother still has not been cast as she urged anyone interested to give it a try. Would she ask So Wah Wai to perform? Kwan Yu said that for now she has not yet contacted So Wah Wai, which would be one of the things to consider. She might also recruit an actor. The film would be an "One Cool Film" investment. Did she have any difficulty to get Koo Tin Lok to invest? She said, "My GOLDEN CHICKENSSS (GUM GAI SSS) was also Mr. Koo invested. He and I have already established trust and I made money for him. So with a phone call to ask him for money, he very quickly said, 'fine'." She said that the film is slated to start production in the second half of the year. She said that she did not know what role she would play. She might ask Andy Lau Tak Wa for help.